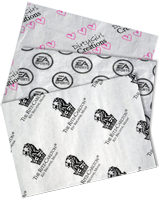 Our line of custom printed retail packaging paper is a great way to add an extra marketing touch to any item leaving your store; it shows an extra level of care and commitment you have for your products. 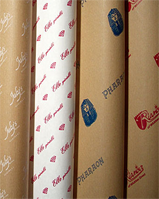 Printed retail packaging can be printed up to 2 spot PMS colors, and has a minimum order of 3,000 sheets or 3 rolls. Our custom retail packaging, including both Tissue Paper and Wrapping Paper is the perfect way to make the best IMPRESSION with your customers! When it comes to custom packaging, Gator Paper is a leader in professional printing and hi-quality products. Give us a call today for all of your custom product packaging needs, including, custom retail boxes, custom retail bags, gift packaging supplies, and retail packaging supplies.